These Basketball Certificates will have players, coaches and parents smiling. Basketball awards great way to recognize players and basketball teams. All you do is personalize, print and present. These make for a great sports gift for a youth coach. Includes 142 basketball award certificates and coach handouts printables. A bundled offering at a low price for the best value. Recognize your players, assistant coaches, team parents, and more with these stylish templates. 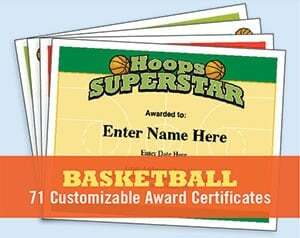 Customize and personalize these hoops, award certificate templates with players’ names, team name, and your own words of praise. Your players will never forget. These printable basketball award certificates are a way to plus up your communication with your players and parents. Your communications will look polished and professional. Designs are set to work on 8.5″ x 11″ paper. It’s simple and easy to do. As a coach or team manager, you’ll look polished and well-prepared with various designs packaged in a downloadable, PDF file that works on a PC or Mac. There are 71 designs for color printers and the same 71 designs for black ink printers. You just add your text to personalize the forms and b-ball awards — players names, team names, words of praise, date, etc. — and you’ll have great basketball awards. These certificate templates awards are super easy to use. These printable certificate templates are easy to use and turn out great! It seems free bball awards just don’t have the same design sense, look and quality. Awards like these have a long shelf life in kids’ rooms – make sure they look good. With a certificate that’s free, sometimes you get what you pay for. When you consider our low price, the number of certificates you can print (unlimited) and the fact that you can use these year after year, this package is a great value. List your team record of your basketball games for the season, your team name, important stats, and more. • Make your players smile! Kids, and adults for that matter, love to hear words of praise. Here’s a cool way to give your players, assistant coaches and team parents a feel-good boost. Present the certificate and heap on the praise. Your players may never forget it. Great coaches know how to recognize players. • Don’t be stingy. Don’t just wait till the end of the season party to award these printable bball awards and make someone’s day. Use them after the first tournament, at the mid-season mark, after a tough loss to lift spirits, etc., etc. • Quick and easy to do. In no time, you’ll have professionally designed, hoops award certificates award participation and achievement — and they look great. 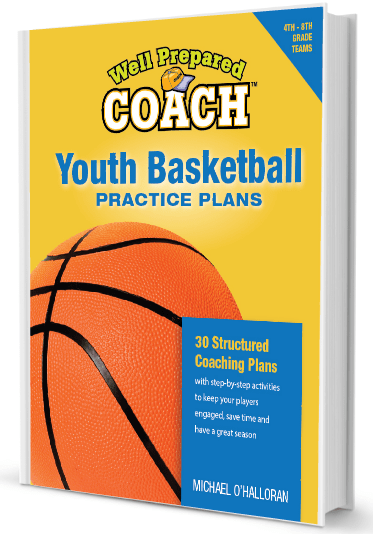 Plus, let your players know when they’ve achieved the basketball goals for the season. • Print as many as you like for your team. These basketball award certificates printables are a great value. • Choices. Lots of designs to choose from. There’s something for every basketball player on your team. • A chance to be creative. You can type whatever you want in the text fields. Some coaches focus on results, while others are more inspirational and may include some carefully selected basketball quotes. Maybe one of your players didn’t score a lot in games but was excellent at one basketball drill. Let him or her know on the certificate. These awards will help you make a big – and lasting – impression at your sports party. • Design that stands out from the crowd. These professionally designed bball certificate templates look great on refrigerators, bulletin boards and bedroom walls. Your download PDF file — good on PCs or Macs — comes with complete instructions. 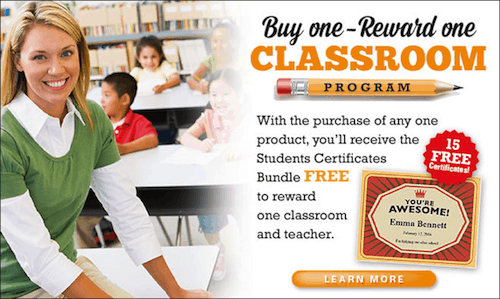 Purchase this product, and receive the Classroom Bundle FREE as our gift to you and your favorite teacher! By whatever name you call them — awards, blank certificates, sports certificate templates for kids, certificate templates, certificates of appreciation — you and your players will love these awards from The Well-Prepared Coach. It will make the hours of basketball practice all seem worthwhile. 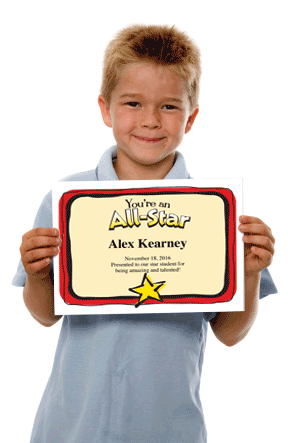 Use this certificate maker to print rewards for players, assistant coaches and team parents. Just personalize, print and present. You’ll make someone’s day! This award certificate maker and coaching forms come as a PDF that works on Mac and PCs. These sports award templates are easy to use. You’ll receive a link after purchase which you’ll click to download the PDF file. You’ll get instant access so you can review the product in full and begin making coaching forms and stylish awards. Special Bundle Price: just $35.50 — Save over $14!